This version works on the Daily chart! it works on very few MT4 platforms such as Hotforex.com, ADS, and AAAFX. There will be one better version to work on 2 timeframes, and sale availability. Only 4-5 clients will be supported, after 5 full sales this will no longer be available. And I will focus on supporting up to 5 buyers with further training and additional signals from other indicators. Correlation between the price of Gold valued in US dollars, and the exchange rate USDJPY. Veteran traders know about this correlation and attempt to create arbitrage trading systems of random entry, where the total trade will always end up in profit, as these two markets are so inversely correlated, and risk in one market is expected to be offset by profit on the other market. Traders would either buy or sell both of these markets at the same time, and expect to go through some profit phase. In reality you do have higher probability of success trading both markets like this, rather than trading either one on its own. However it was found in actual tests that totally random arbitrage trading does not really work, as both markets end up moving in the same direction and they keep moving for longer than the average account can take, so that both trades are either in profit or loss, and no much hedging protection is really achieved. So in reality the two markets are not 100% negatively correlated, positive correlation can kick in, and it can last as long as 2 months! Hedging strategies tend to be extremely profitable and very low stress, there's no need to look at charts or place stops! REMEMBER WE ARE TRADING THE SYNTHETIC COMBINED MARKET NOT GOLD OR USDJPY INDIVIDUALLY! Momentum cannot be measured - and it's NOT live trading! Please ask me to guide you how to use this indicator, don't use on your own at first. This trading strategy is 10 times less risky than any other approach! Because trades are not set on fixed direction, nor we use stops. We can be wrong about either GOLD or USDJPY on direction, and yet the trade will stil go right and make money. While positive correlation market risk is avoided by the indicator, and the rest of the risk is handled by hedging which comes into effect during negative correlations. This is very low stress trading, because you don't have to worry about placing stops and looking at market charts. 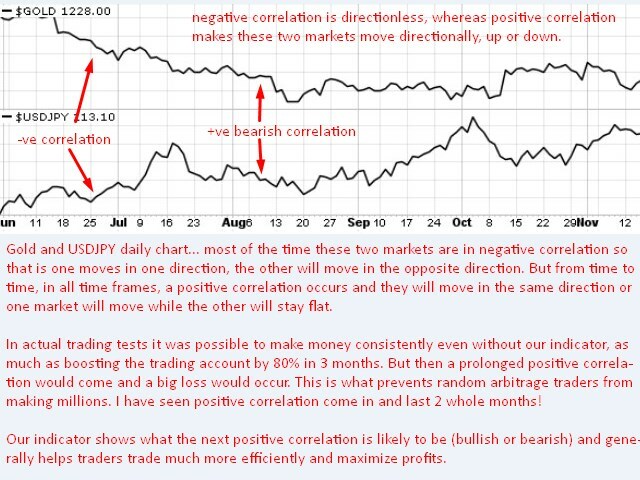 Even if you trade these markets using random entries you may still have long winning streaks, but finally a single prolonged absence of negative correlation in the 2 markets will crash you. This is what our indicator can prevent, by helping you make directional and not random entries and exits! This makes it possible to even repair blown forex accounts from other strategies that failed. Even blown accounts with 10% balance left, can be fully recovered through this strategy. To use this indicator, you can run it on the DAILY CHART (manual will be available, full manual to buyers only!) . All the trader has to do is watch the silver line. IF the silver line has gone lower than all other lines, expect negative correlation with the possibility of a bounce and positive bullish correlation and buy both Gold and USDJPY in all trades. 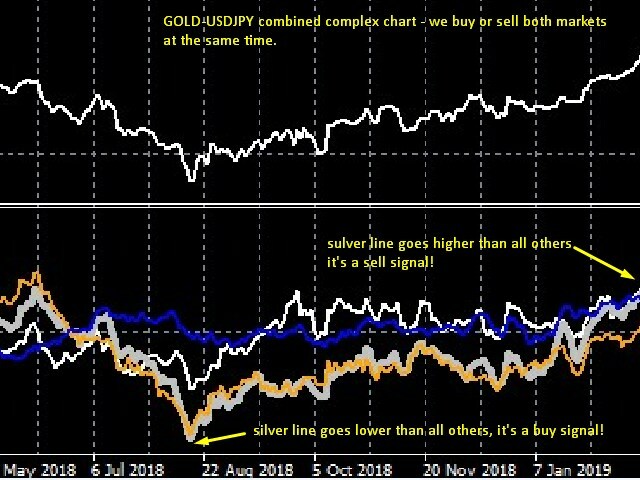 IF the silver line has gone higher than all other lines,again expect negative correlation but with the possibility of a drop and positive bearish correlation, hence only sell both Gold and USDJPY. In negative correlation you can add to losing trades. A perfect offset only lasts for a while, then markets will diverge again. Ideal trade size at 100:1 leverage: one lot on each market. If you execute this code and the price of gold is not shown, then our indicator will not work either, even if the symbol XAUUSD is available for trading! it works on the MT4 platforms of Hotforex.com, ADS, and AAAFX.